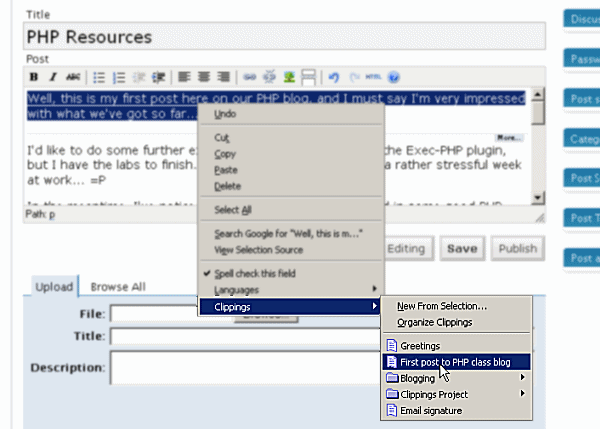 Clippings is an Add-on which saves and manages frequently-entered text for later pasting into online forms in Firefox or email and newsgroup messages in Thunderbird. Pasting a clipping is accomplished with just two mouse clicks, eliminating the hassle of retyping or repetitive copying and pasting. You can even add and organize the copied text in different folder. It’s been a helpful tool, I don’t want to miss anymore. this plug in is important specially if you keep posting or fill up forms on a daily basis like me! it saves you a lot of time. Yeah, that’s why I need it so often too.